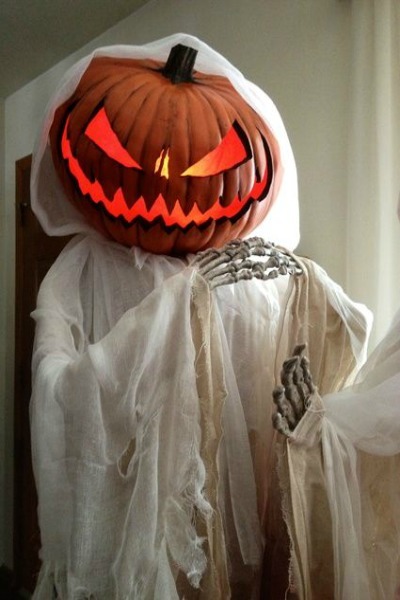 Halloween is a popular celebration in the western countries where adults and kids dress up as scary monsters,ghosts and spirits and even wear funny and creative costumes and go about their neighborhood saying ‘Trick or Treat ‘ and collecting candies and sweet treats. This Halloween day is believed as the day when ghosts, spirits and monsters roam about the earth. While there are so many options to dress up on Halloween there will surely be times where you will plan to go about in a group or need a family costume. 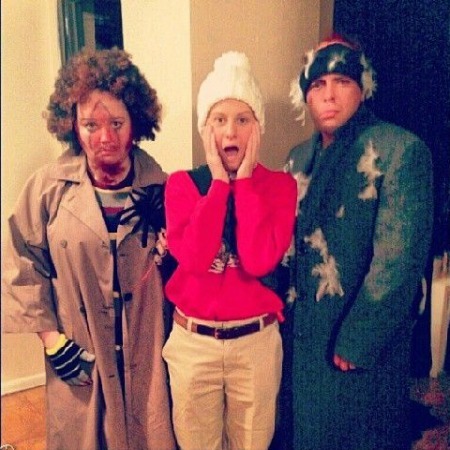 Today we share a few scary and fun Group Halloween Costume Ideas to try this year. Everyone loves a relaxing hot bath and we believe you love having that special Body was using your favorite loofah. 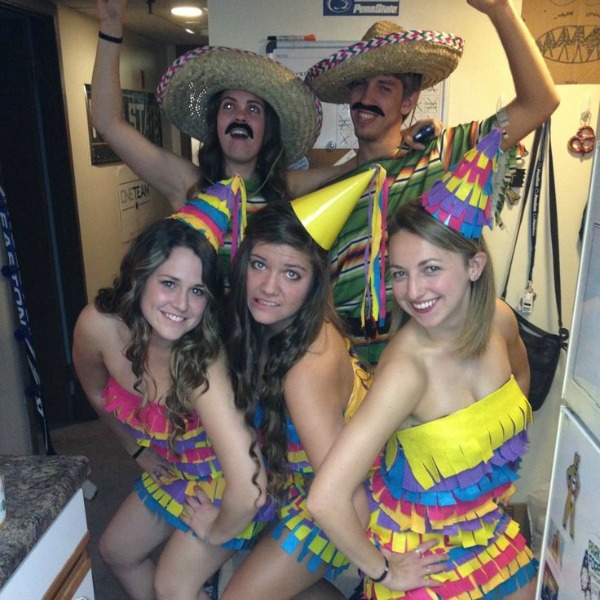 This Halloween Group costume idea is very unique and fun. Here three girls have dressed up as Loofah and this costume is really easy to make. To make this costume one will need 25 to 30 yards of tulle fabric and safety pins or some basic stitching skills. Wrap the tulle over a basic tube top and gather it in places using pins or use a bit of stitching and wear some spandex shorts ; don’t forget to attach a bit or cotton string to finish the loofah costume. 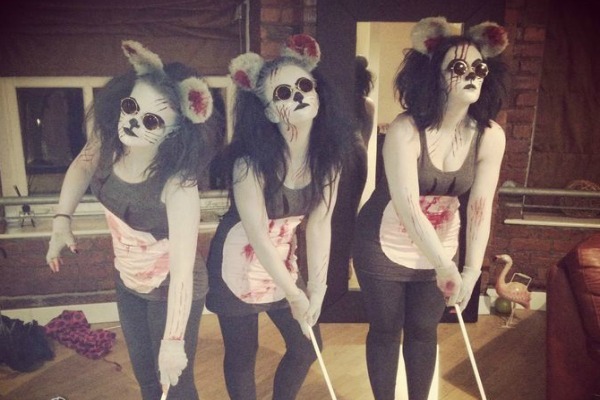 This group Halloween costume ideas of the three blind mice is absolutely marvellous. The costume requires very basic clothing and no such skills at all. Just wear similar clothes, add a white patch of cloth to the bottom part of your tank top. add some fake blood , some whiskers, a pair of mouse ears and identical round spectacles to complete the look. Also don’t forget the walking sticks. 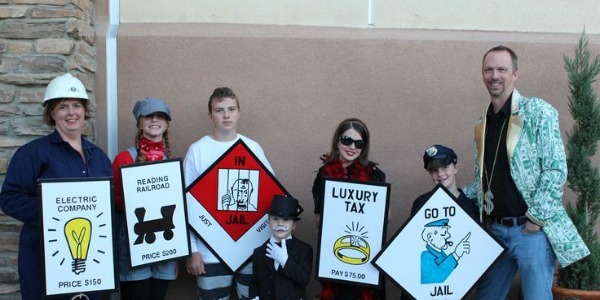 Monopoly is a very popular family game and here’s a great group costume featuring many Monopoly features and characters. There are various characters and options when searching for the suitable character for any member of your family or group. Dressing up as characters is easy too, you will need basic products and clothing which can be bought from thrift stores. If you love surprises and have had pinatas for your birthday parties before then it is a great idea to dress up as Pinatas this Halloween. These sweet pinata costumes are easy to make and very colorful. You can use a tube dress and attach colorful felt with fringes cut on them. use the striking colors. here two people have dressed up as Mexicans and they carry sticks and pretend to smack the pinatas oto get Halloween candy. 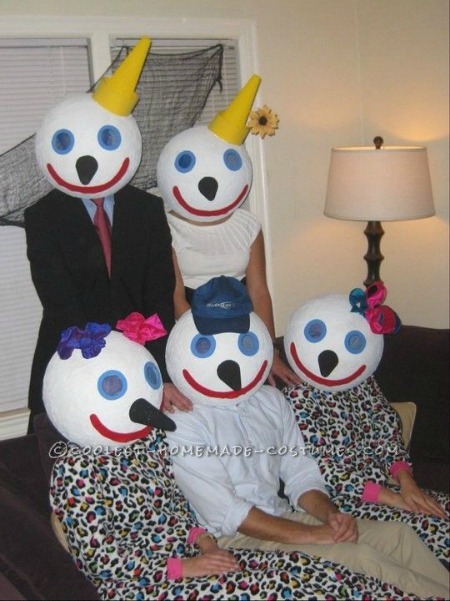 These Jack in the Box costume ideas is really funny. You can add any number of people in this costume idea . make them wear round masks and put special accessories on each one. These group of construction workers costume is a really fun way to dress up as a group on Halloween. This idea works as a last moment option too if you’re short on time. Some Neon shade tees and tanks and some shorts along with some construction hats and some DIY construction gear this group Halloween costume idea is great. If you’re not afraid to show some skin on Halloween then this Ketchup Bottle Group Halloween Costume Ideas is a great option. These girls dressed up as Sauce /ketchup Bottles in colorful short tube dresses and added some cool texts to their costume too. 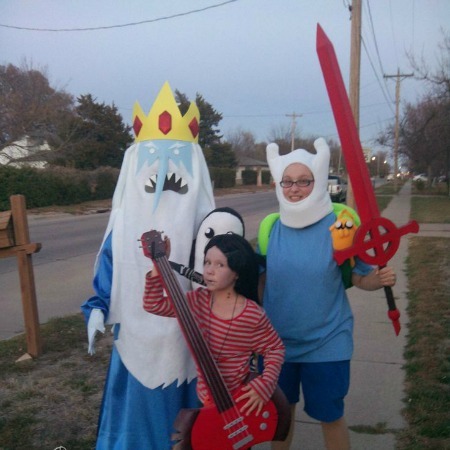 Adventure Time Trio costumes are perfect for a Group of people and are quite popular as Halloween Costume inspirations. Here’s a great DIY homemade version of the costume and characters. These are easy to make and can be done at home with little effort. 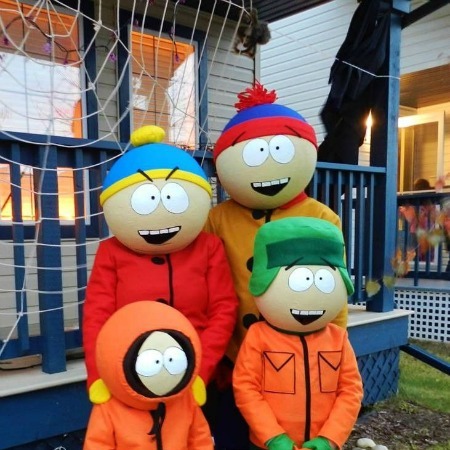 If you have loved the American Sitcom South Park then here’s a great way to dress up like them and celebrate Halloween this year. This idea works great for a family as you can look more realistic. The character costumes are not too complex and the main focus is the Head portion which has to be made with care. To make the heads a inflatable rubber ball has been used and paper mache layers used. At last paint and a bit of felt cloth accents. Here’s another attempt as the ‘Alice in Wonderland’ theme for Halloween. this theme provides many characters for a large group and it is easy to make costumes for them. 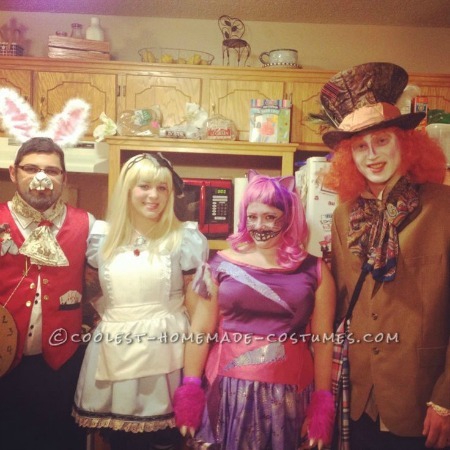 here the main characters are seen which are Alice, Cheshire Cat , The Hatter and the White Rabbit. 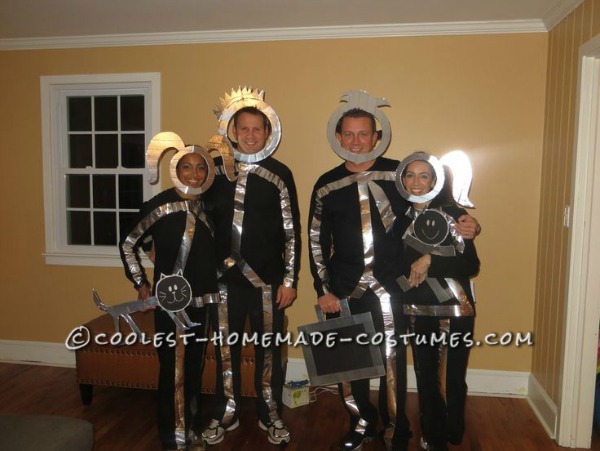 Making these stick figures family costume is really easy and can be done easily. You will need some foam boards, duct tape, black clothes, some cardboards and some elastic to make this costume. Add a small prop to each character to complete the look. These green plastic soldier costume is a really innovative idea to dress up on Halloween. 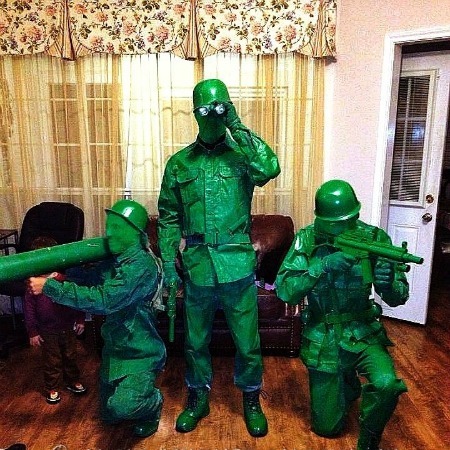 Most kids have owned these little plastic soldiers in their childhood and here’s how you can dress u as them and enjoy on Halloween. 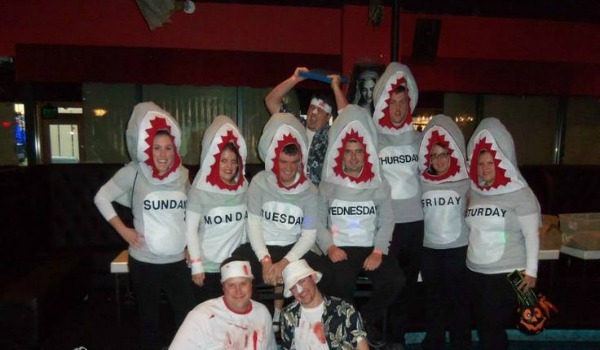 Here’s a group Halloween costume to celebrate the discovery channel epic week-long show ‘Shark Week’ . If there are more than seven people in your group then some may also dress up as Shark attack victims. The trick here is same shaded tops and same headgear which is made at home. Black and White Cinema characters are a great inspiration for Halloween costumes. 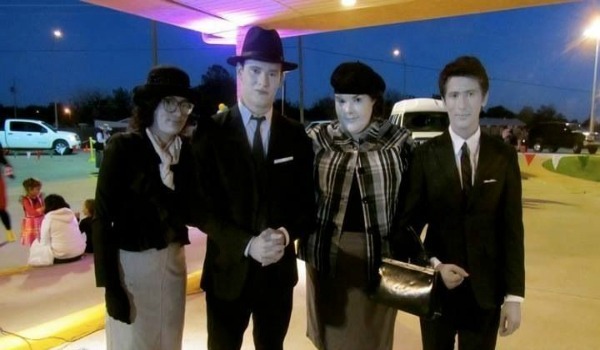 You can easily dress up as your favorite characters from the Black and White era. Apply some white makeup, add some vintage clothes and accessories and you are ready to party on Halloween. This ‘Home Alone’ movie inspired costume is really easy to assemble and takes very less effort. You will have most of the apparel at home and all you need is a bit of makeup and some feathers. 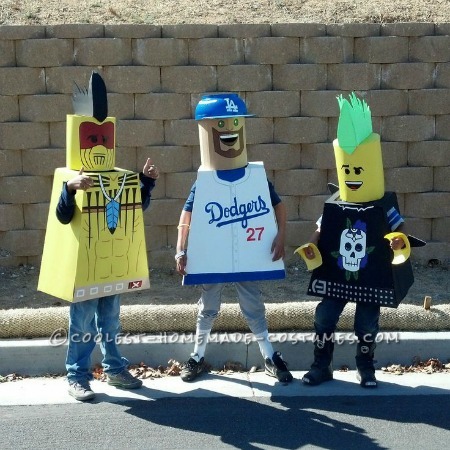 These Talk of the town Lego miniature costumes are made out of cardboard and poster boards. These feature Tomahawk Warrior,Matt Kemp and Punk Rocker Lego characters and can be made with a bit of effort, cardboards, glue and paints. 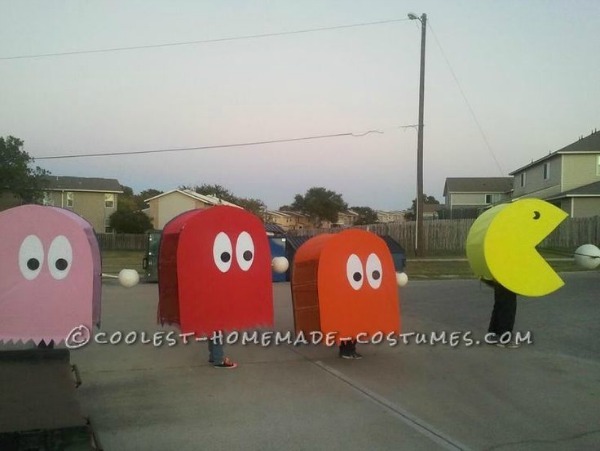 Pac-Man has been a well known game and here’s how you can celebrate this spectacular game by dressing up as Pac-Man game characters. The costume requires very basic items and can be made with very less effort. If you’re a fan of the ‘pretty Little Liars’ series on television then this is a nice idea to become the characters and dress up on Halloween. This costume is really great as a last-minute costume as you can easily find a little black dress in your wardrobe and there is no special additions as such other than the ‘A’ letter stuck to one of the girls. 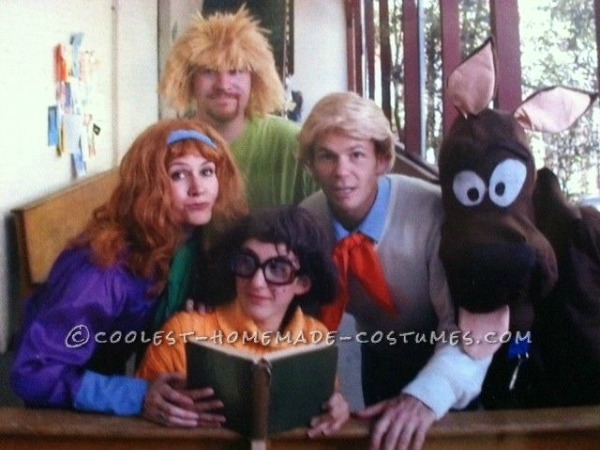 the adventures of Scooby Doo has been a favorite among kids and adults equally and here’s a great way to incorporate them in real life. You can easily make yourself costumes for the characters of the series like scooby doo, shaggy, Velma, daphne and fred . We are sure you’ve seen the ‘101 Dalmatians’ movie and have been quite fascinated by all those cute furry puppies. Here’s a great idea to introduce those cute little puppies and characters into the Halloween Group Costumes. 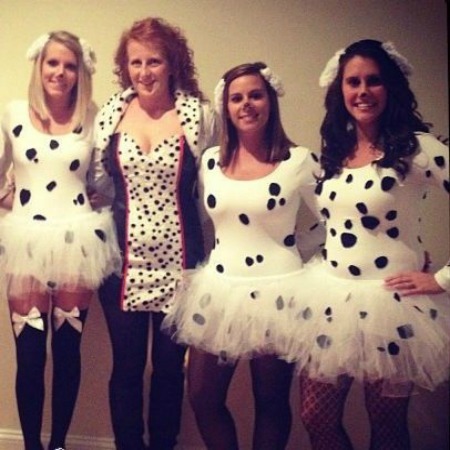 You and your Girlfriends can dress up as the cute little Dalmatians and one of them can dress up as Cruella De Vil. 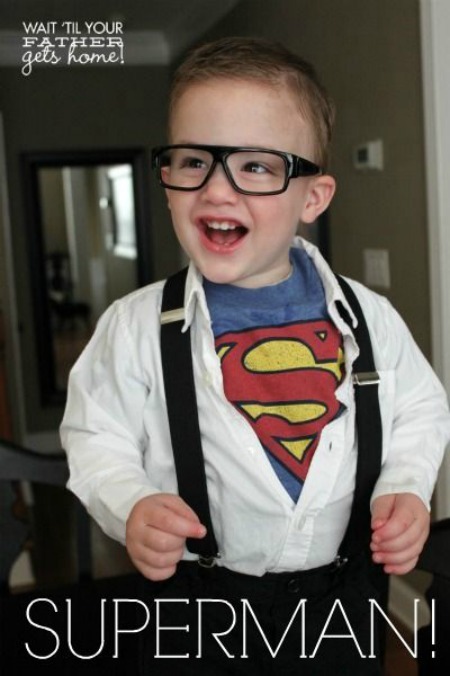 Do let us know which of these costume ideas you have loved and want to try this year. There are many ideas we missed but we will surely be featuring a lot more Halloween articles soon.